Traveling in Laos is relatively easy but very slow. The roads are well connected and it is easy to get tickets with pick up included at every hotel. The problem is that the condition of the roads is bad and the distances get very long. There are many mountains, which means many curves, and also many cows and buffalos wandering around, which makes the routes slow and exhausting. 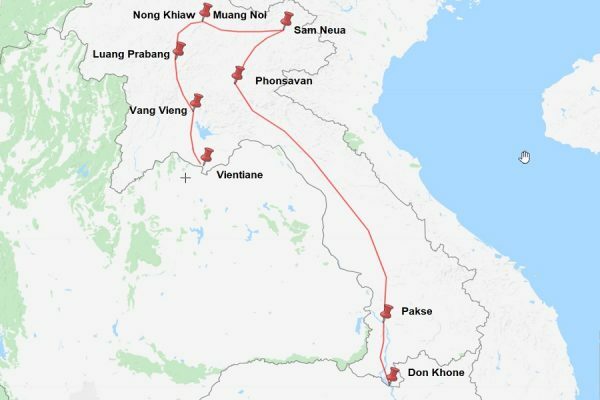 We spent 3 weeks in Laos and crossed the country from north to south. In this post we will tell you the route we followed and how we moved around the country. 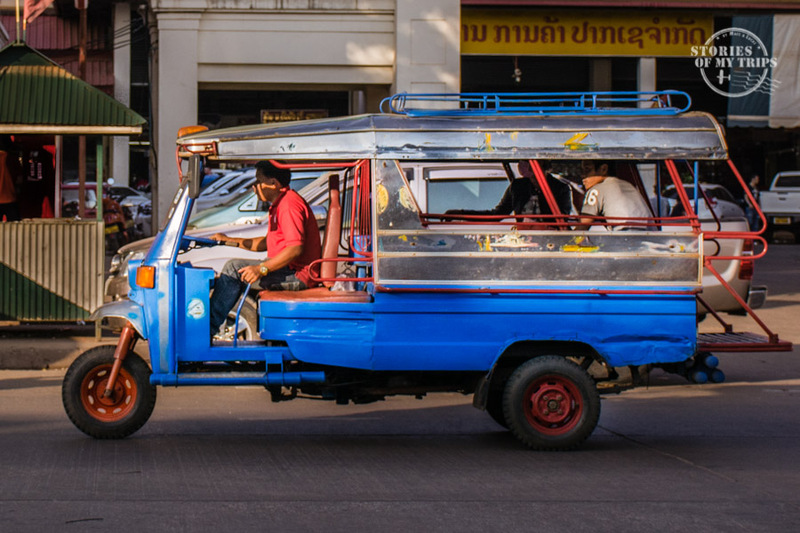 If you are planning a trip through Laos, this information will help you know what to expect when you get there transportation wise, and plan the logistics of your trip. We landed in Vientiane coming from Yangon. We had to do the Visa On-Arrival process. We did the line, filled the form (where we were asked the race), we handed over the photo, we paid (the price is different depending on your country of origin) and in 2 minutes the visa was stamped in our passports. We shared a taxi to the center with other travelers. There is also the option of taking a bus, 500 meters from the airport. In Vientiane our hostel was very well located and we did not have to take any kind of transportation, it was possible to walk around the city center and the surrounding area. We stayed in Vientiane for 2 days. To go to Vang Vieng we bought a bus ticket (the cheapest) in a hostel that included the pick up, but we ended up traveling in a minivan (the most expensive). The journey lasted 4 hours and the bus station was a bit out of town. The tuk tuks wanted to overcharge, so we decided to just walk and in 20 min we arrived at our guesthouse. We stayed 3 days in Vang Vieng, where we did kayaking, tubing in a cave, and went to Blue Lagoon, all in a tour package. The town is quite small and you can walk everywhere. After Vang Vieng we went to Luang Prabang. We bought the bus ticket at the same place we bought the tour in Vang Vieng, so we received a good discount and the pick up was also included . We were picked up again by a minivan and it was 4 hours to Luang Prabang. Again the bus dropped us off the city, but this time we had to take a tuk tuk to the hotel. We stayed 3 days in Luang Prabang. 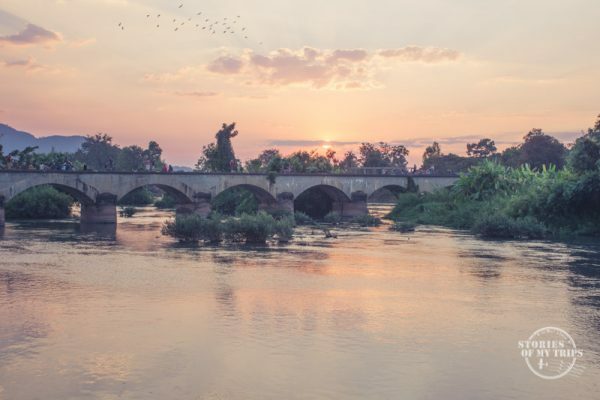 We went to the famous waterfalls of Kuang Si by motorcycle and the rest of the time we walked around this beautiful city with French accent and beautiful sunsets over the Mekong River. We bought the ticket at the agency that offered the best price (we had to ask around a lot), which also included pick up at the hotel. We were taken to the bus station and again we had to ride in a minivan. It’s the same system everywhere. Again it was 4 hours and again we were dropped off out of town, but here the tuk tuk was reasonably priced and we did not hesitate to take it. In Nong Khiaw we relaxed for 2 days where we walked along the river, through the village, ate a lot and slept. We also rented a motorcycle and visited the neighboring villages where kids kept waiving and greeting us. There is not much more to do than relax, unwind and enjoy the scenery. We wanted to go to Muang Ngoi but there was no way to go just for the day so we decided to spend a night there. There are no roads to go by bus or motorcycle, you can only go by boat. We took the 11am boat which lasts 1 hour (the other option is at 2pm) and when we arrived we were so pleasantly surprised that we decided to stay not one but 2 days. This village is smaller than Nong Khiaw and you can walk from one end to the other in like 15 min, but it is beautiful!. Here we hired kayaks and went down the river to the beaches. To return to Nong Khiaw we took the only boat that leaves at 9am. We bought the ticket for a night bus from a travel agency, where we were told that the bus would pick us up at 6pm (it was coming from Luang Prabang) and we were very naive to believing them. Actually the bus arrived at 10pm and during those 4 hours all we could do was sit on the street and wait. The bus took 12 hours to get to Sam Neua, fortunately it was somehow comfortable and we were able to sleep. When we arrived at Sam Neua we had to walk only 10 min to the center to find a hotel. We stayed in Sam Neua for 3 days, it is not very big so you can walk around the center. To go to the caves of Vieng Xay you can take a bus at the station (but no one can tell the times, everyone says something different between 7 and 9am) and to return the information was even more confusing. We wanted to go independently but could not find where to rent a motorbike, in the end we decided to relax a bit and do it the easy way, we negotiated a tuk tuk that took us in time to do the tour of the caves that starts at 9am, he waited for us and brought us back for about 20 USD. We bought the ticket to Phonsavan directly at the bus station in Sam Neua the same day of the trip because they do not sell it in advance. We took the “bus” (minivan) at 8am and arrived at Phonsavan at 4pm. Here we rented a motorcycle for 2 days, one day to visit the Plain of Jars and the other day to tour the surroundings and the beautiful landscapes. After Phonsavan we went south, on the longest trip to Pakse. We left at 7am and arrived at 11pm in Pakse, in time to get to the hotel before they close it at midnight. And we were very lucky because we heard stories of people arriving at 2am and having to wait until 6am to go to their hotel (because every hotel is closed from midnight to 6am). In Pakse we only stayed one day walking around the center and hanging out in the river. We chose Don Khone because it was the most peaceful one and with better accommodation options than Don Det, which was perfect for us since we wanted to celebrate Valentine’s Day and our anniversary in a special place. To go to Don Khone we bought directly in our hotel in Phonsavan the bus ticket that included the boat. As usual, we were picked up from the hotel, got on a bus to Nakasong. From there we had to walk 3 blocks to the port, show in the office the receipt to receive the ticket for the boat, and they took us to our destination.We stayed 3 days in Don Khone in a bungalow in front of the river. We rented bikes to go around the island and visit the waterfalls. The rest of the time we walked down the main street of the village and relaxed on the river, which is the best pastime in Laos. To cross the border from Laos to Cambodia we read hundreds of warnings about the scams on the buses and at the borders, so we decided to do the crossing independently instead of going in group on a bus. First we took the boat at 8:30am from Don Khone to Nakasong. Then we walked to the bus station and bought a ticket to the border. At the border we did the procedures ourselves to get the exit stamp and were forced to pay $2extra for the stamp (scam), then we walked to the Cambodian side and had to do the whole process of filling out the forms and had to pay $5 additional to price of the visa (another scam). Finally we crossed the border and on the other side was the minivan we had booked online. This is how we ended our adventure in Laos and began the one in Cambodia. 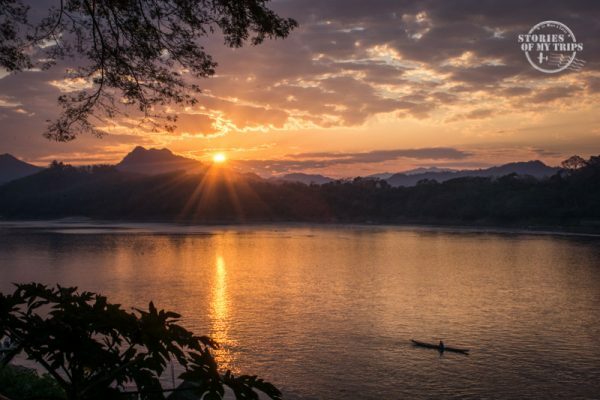 We have a lot to tell you about Laos, we learned a lot about its history and its people. In future posts we will talk about each place we visited. If you have questions about traveling in Laos, please leave them in the comments. Posted in Laos, Preparation, Routes, Transportation. My wife and I are planning a similar trip in Nov 2018. Did you use backpacks or suitcases? Many long bus rides. Were there any places that you felt that what you saw was not really worth the long ride to get there. We would love to hear about your Cambodia experiences as we are also planning to go there but will probably fly to Seim Reap and work our way from there. Thanks for your comments.